You’re not imagining it. The words “chocolate chunk” have been appearing quite often on this blog lately. Ever since I discovered how they melt into baked goods, more so than chocolate chips, I’ve been kind of hooked. I’ve actually kind of unofficially stepped away from regular chocolate chips for the moment. The Scharffen Berger folks fed right into my addiction, gifting us BlogHer Food ’10 conference attendees (you can see my Top 10 Most Memorable Moments on my other blog, Panini Happy) with a little pouch of their fabulous semisweet chocolate chunks…along with a zillion other decadent chocolate treats. I was back home for not even 24 hours before my little girl and I donned our aprons and baked up the recipe (by the legendary Jacques Pépin!) from the back of the package. If you’re familiar with Dorie Greenspan’s incredible World Peace chocolate sablés, these sandy, rich, slice-and-bake Jacques Pépin cookies are along the same lines. One key difference is that Pépin has you roll the cookie dough in sugar before slicing so the cookies have a wonderful sugary rim. His recipe also calls for manually pressing in the chocolate chunks at the very end rather than mixing them into the dough. Don’t worry – those three chocolate chunks I managed to wedge in pack more than enough decadence! Set aside chunks and 1 tablespoon of sugar. Mix remaining ingredients in a food processor for 30 seconds or until smooth. Transfer dough to a sheet of plastic wrap and roll into a 10″ log, 1″ thick. Refrigerate 1 hour. Preheat oven to 350°F with rack in center. Unwrap cold log and sprinkle evenly with remaining tablespoon of sugar. Cut log into 20 cookies, each 1/2″ thick. Spread chunks on a board and press each cookie into them. * Line a cookie sheet with parchment paper. Arrange cookies 1″ apart, chips facing up. Bake 14-15 min. Cool on wire rack. * I just pressed the chunks directly into the cookies – about three of the Scharffen Berger chunks seemed to fit comfortably in each cookie. Oh I’ll definitely be trying these out. I’m so in love with Dorie’s World Peace Cookies and I can’t imagine anything less than loving something from Jacques Pepin! 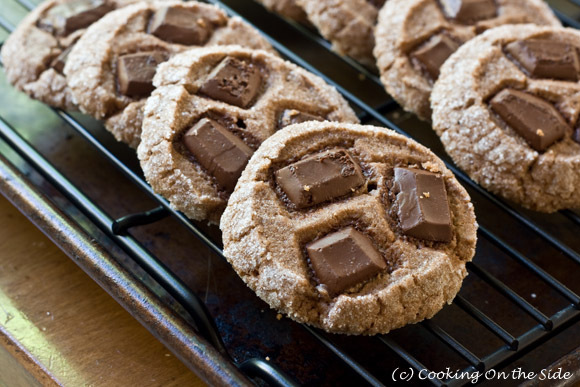 these look amazing… I am a big fan of chocolate chunks in cookies as well! I made some smore cookies and the chunks were a perfect addition. A cookie recipe from Chef Pepin! I’m sure it’s divine. And I’ve been wanting to make Dorie’s World Peace cookies for some time- now I’m convinced I have to! Cocoa powder is awesome in your recipe. It’s my first time to see cocoa powder in a cookie recipe. Thanks for this new idea. LOl. Maybe I should try this one and share it with my kids. 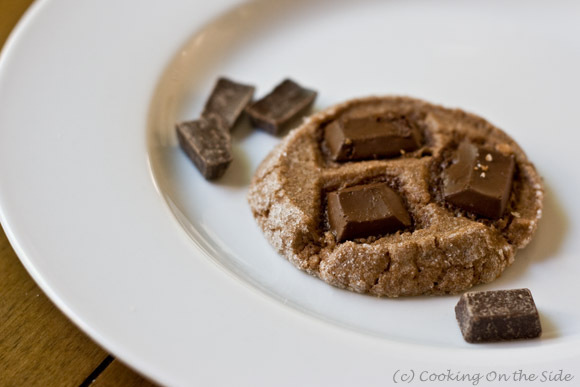 I love the idea of mixing chocolate bars on the cookies. It is so chocolate-y and so indulging. My kids will be surprised if I made some of this later. Thanks a lot. These are the best cookies I have ever made and I have backed a lot of things over the years. They have the best flavor (not to sweet but just sweet enough) and texture. I love the chocolate chunks. These are also really easy to make.